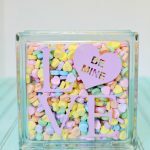 I love my Silhouette Cameo. 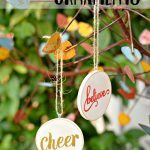 I’ve used it to make so many fun gifts, home decor items, and tees for myself. With this machine, I’m also in a lot of groups which talk about crafting with Silhouette Cameos, or Cricut machines, and a question that I have seen multiple times is “Can I use a Microsoft Surface to run Silhouette Studio?” or “Will my Cricut work with a Microsoft Surface?”. The answer is absolutely! I’ve been using a Microsoft Surface product for 4 or 5 years, both of them running Silhouette Studio perfectly fine.There are a couple caveats to this answer. An original Surface (not Surface Pro) will not run Silhouette Studio. The Original Surface was based off of ARM architecture rather than x86 (Intel) and ran Windows RT which didn’t allow for programs to be installed that weren’t part of their app store. This original Surface was more like a giant phone/tablet rather than a computer. The second caveat is the new Surface Go. While these products do run on an Intel processor, they come with “Windows 10 S Mode” which does not allow for installing additional programs other than what is in the Windows App Store. You can pay for an upgrade to a full Windows Operating System; however, at that point you might as well upgrade to a different Surface product (my understanding is that it also only has a USB Type-C connection so you would need an adapter to plug the machine in as well). The first Surface that I used to run Silhouette Studio was a Surface Pro 2. 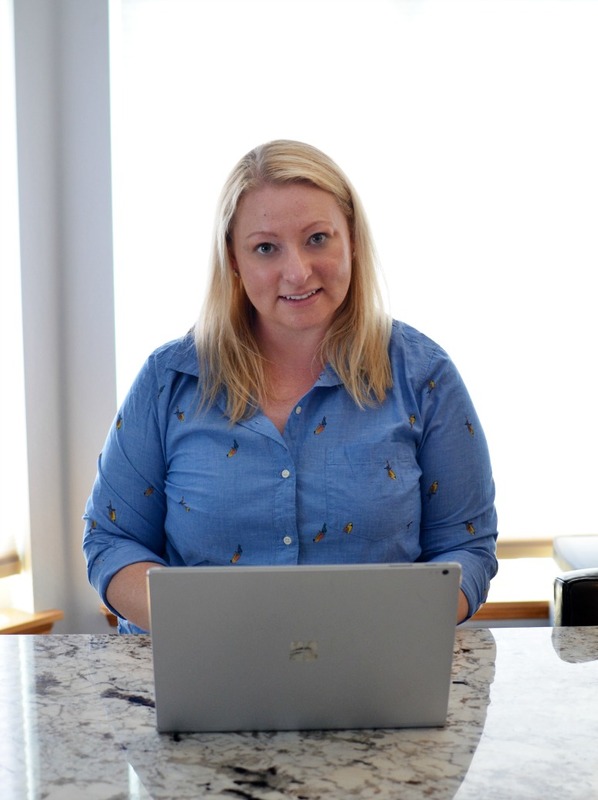 A couple years ago, I switched to a Surface Book (which i absolutely LOVE). The system requirements for Silhouette Studio are actually pretty small and just about any computer on the market today will suffice. One of the great things about the Surface book is that it behaves like a laptop (as I type this, I’m sitting on the couch using it just like a laptop); however, the screen can be detached and rotated to be used like a tablet as well. The Surface Book also comes with a Surface Pen which allows you to draw in Silhouette Studio if you like to design by hand. 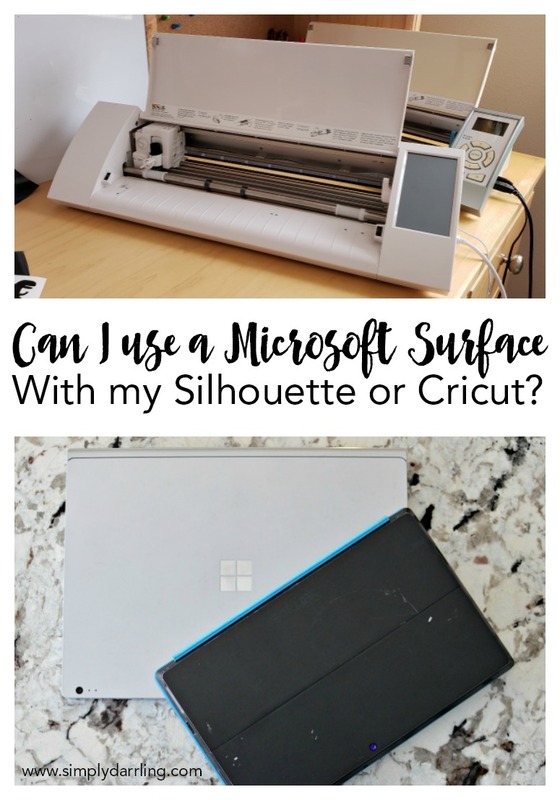 Currently there are four main Surface products which will work with the Silhouette or Cricut – Surface Pro, Surface Laptop, Surface Book, and Surface Studio. Any of these products would work great for use with the Silhouette Cameo. Finding which one is perfect for you will depend on how you work. 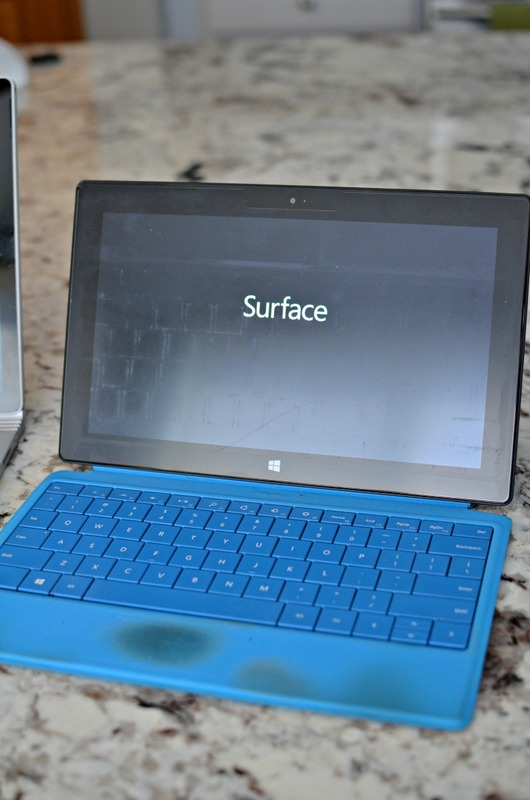 The Surface Pro utilizes a “kickstand” to help the screen stay upright. This is a downside if you like to use it while sitting somewhere like the living room and want the computer to rest on your lap. When I used my Surface Pro 2, I actually had a lap desk that I would use along with it to keep the screen from falling over. If you’re going to be working at a desk or table, but want the option for tablet use with the same device, then the Surface Pro could be your perfect device. The Surface Laptop is just as it sounds – a laptop. 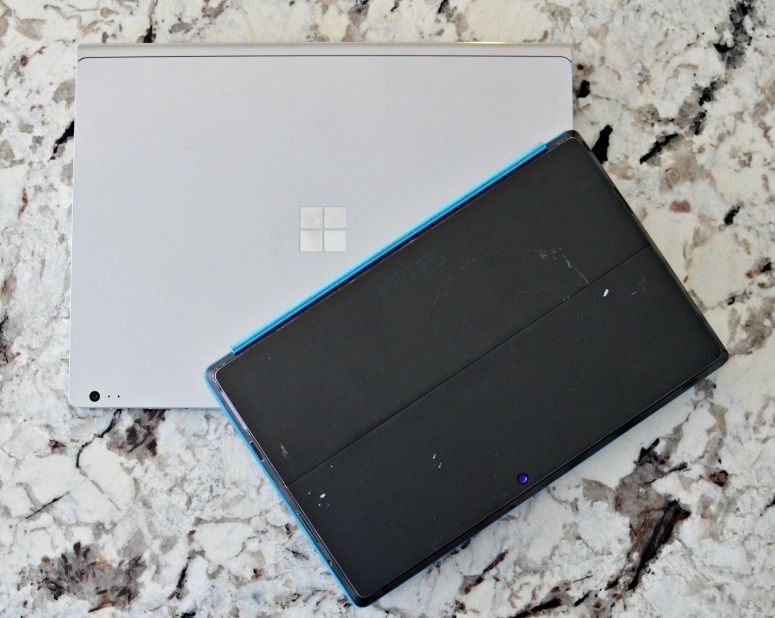 It has the full functionality of a great laptop, but without the removable tablet aspect. The Surface Book combines the best of both worlds. It has the laptop functionality since it can actually be used on your lap; but it can also be used as a tablet. The Surface Studio is a whole separate category. This all-in-one computer is a beast and amazing. The Studio would be a great product for somebody who does a lot of designing, but doesn’t need the portability. Overall, if you are looking for a new computer for your vinyl designing and crafting needs. 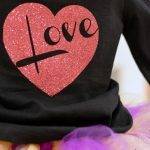 The Microsoft Surface products are great choices and can definitely be used for the Silhouette Cameo or Cricut machines. Hi, I’m looking at purchasing a surface go. Would it work with my silhouette studio? The Surface Go would not work because the Windows 10 S Mode only allows for apps to be installed from their app store. The Surface Go Pro would technically work because it has full Windows, but I wouldn’t recommend it for Silhouette Studio use as the amount of RAM and CPU processing power is pretty low. 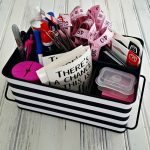 I have a surface pro 3 and a cricut air 2 and I can not get my design space to work. What is the trick? Hmmm, it should work just fine. Do you get some sort of error when you try to run it? I have been using my Surface pro 3 with my cameo but have been having problems lately with fonts loading into the Sil program. I know they load onto the Surface because they are on every other program. I thought I would ask you since you usually use yours. Didn’t know if there was a setting that I am missing!